Yay – it’s Friday! Friday’s begin the weekend and weekends offer all sorts of READING time! So to help you make your reading decisions, I’d like to introduce you to Xander from his book Xander’s Tangled Web by Susan A. Royal. Welcome to Strands of Thoughts, Xander. Can you tell us a little about you, please? Good day to you! Can you see me? (waves arms) I’m down here. My name is Xander, and I’m descended from a race of little people called Mipins. I’m easy-going and laid back, and I love the hustle and bustle of city living. Not so my wife. Suse grew up in the country. She’s a pretty little thing with big, blue eyes and a wide smile that still melts my heart. My looks aren’t what won her heart, that’s for sure. Not with my hooked nose, crooked smile and large, uneven teeth. Up until last year I was constable for the city of Battington. Located in Seren Valley in the Kingdom of Regal, it is cradled on three sides by the Heliotrope Mountains and to the south by the Azure Sea. I had a pretty wife and a good job. Things couldn’t have been better. That is until Cymon, the mayor, decided to make my life difficult. He has the knack of telling people exactly what they want to hear and leaving out the details. I’m certain this ability is how he managed to win the election. Of course, following through with his promises is another matter entirely. I know. As constable, I was forced to deal with Cymon on a regular basis. It didn’t take long for me to learn he wasn’t always as good as his word. Things went from bad to worse until I finally resigned. Suse and I moved to the country so I could try my hand at farming. Unfortunately I’m not very good at it. It’s difficult to work with people you know you can’t depend on. It sounds like you have a lot on your plate with your new adventure. Is trying to make a go at farming the only conflict in your life now that you’re in the country? Cymon has hired me to investigate Princess Mena’s disappearance. Spring Festival is right around the corner, and King Leary has already imposed a curfew on the town. When the news of Battington’s trouble spreads, (and it most certainly will) people are going to stay away in droves. If I don’t find out what happened to her and fast, it’s going to spell trouble for all the merchants. Oh no, the poor princess! What are some of the biggest stumbling blocks you’ve encountered trying to find her? The princess came to the market for a love potion. That complicates things. When romance is involved folks who are normally very sensible tend to lose all reason. Tempers flare to the brink of violence and sometimes beyond. Past experiences dealing with people in this kind of situation have taught me there is nothing worse than what might happen when a romance cools, particularly when it’s one-sided. Worse yet, the situation might be a triangle. Other than your lovely wife, do you have anyone else you can rely on? I’ve known Phineas, Battington’s miller, since before Suse and I were married. Although he lays claim to being a confirmed bachelor, he’d marry in a minute if he could find someone who would put up with him. I can always count on my old friend whenever I need help. His thickly muscled torso does much to deter potential troublemakers and he’s more than willing to assist me with some of the less appealing jobs. He’s keen on things most people would balk at doing. Especially when it involves a ruckus. We’d love to know you a little better. How about you tell us about your strongest personality trait? My demeanor seems to indicate an answer is beyond my grasp and those who don’t bother to get to know me mistakenly assume I’m a little slow-witted. To be honest, a casual observer would never venture to guess I was a constable. I could easily be mistaken for a tavern keeper or some other occupation requiring a good listener. This homely face of mine seems to draw everyone. Before they realize it, people share things they would normally never divulge. I pay close attention while my mind processes everything they say. Lovely to talk with you Xander. Best of luck finding the princess! 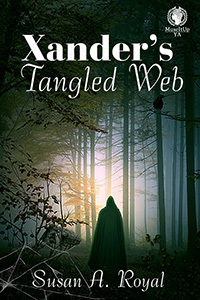 Readers, here is a little more about Xander’s book, Xander’s Tangled Web. After a late night visit to Battington’s marketplace, Princess Mena vanishes without a trace. Merchants are frantic, because King Leander has called for a curfew and postponed the spring festival. Certain his former constable is the man for the job, the mayor hires Xander to investigate, hoping he can solve the mystery in a hurry so things can go back to normal. But Xander’s not so sure that’s possible, because there’s romance involved, and he knows when that happens folks who are normally very sensible seem to lose all reason. In addition to sorting out truths, half-truths and outright lies, he must deal with gypsies, love potions and an illegal moonshine operation before he gets to the bottom of things. Susan A. Royal takes her readers on adventures to other worlds where anything can happen and frequently does. She and her husband share a 100 year old house in east Texas with a ghost who likes to harmonize with her son when he plays guitar. She writes SciFi/Fantasy with action, adventure and liberal doses of romance. She is currently working on the third in her time travel series, It’s About Time. Look for her books at MuseItUp/Amazon/B&N. Want to know more? Visit susanaroyal.wordpress.com or susanaroyal.moonfruit.com for a peek inside this writer’s mind. You never know what you’ll discover. BTW's I'm over on Susan's blog also. After you've left her a nice hello in the comments, hop on over to visit us there to! Susan A. Royal. Xander wants me to let you know he had a great time doing his first ever interview, Kai. Thanks so much for having us on your lovely blog. Readers, please take a moment to pop over to my blog, susanaroyal.wordpress.com for Cake, Coffee and Conversation with Kai! It's a pleasure to host him and to learn more about his book. Great interview. The book cover is mysterious and makes me wonder who that person is. Congratulations, Xander. Best of luck to you. Thanks for stopping in to say hi to Xander, Beverly. Aye, I have several encounters with the mysterious figure, and I'm certain whoever it is has something to do with Princess Mena's disappearance, so I'm determined to find out who it is. Love the cover! Good luck with the book, Susan! The cover is fantastic. Thanks for visiting, Katie. I do too. Thanks Katie!